shirls gardenwatch: What goes with white? Your avian activity is increasing Shirl. It must mean that spring isn't too far way. We too have had some bird activity. We saw a HUGE flock of 1200+ American Robins this weekend. I have never seen such a large flock of Robins. Usually when large flocks are seen in the country it will be some type of black birds. It was fun to see and hear. That Black cap is a beauty. As is your pretty Robin. I love seeing your posts any time you want to post them. Again lovely shots - I do like all these little birds. Your robins are so pretty. I think the colour is more orangy than red too. Your birds must be happy. So many cool and yummy treats to try and invigorate themselves with. I wish I could see as many as you in your garden!! 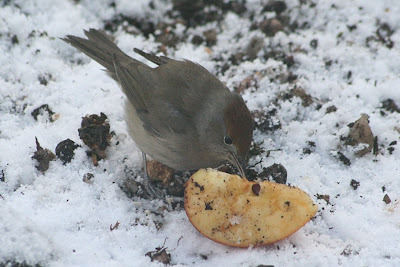 Lovely shots of the Blackcap on the apples. 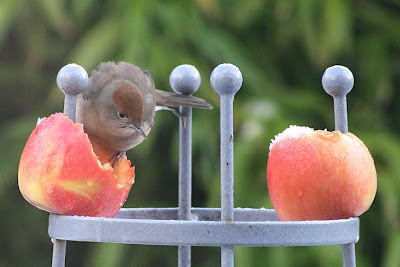 I've never tried apples in the garden, I'll have to try that one. After seeing your apples I am going to HAVE to try that out. I think I have a place where the squirrels can't get them, or the other creatures, such as opossoms! 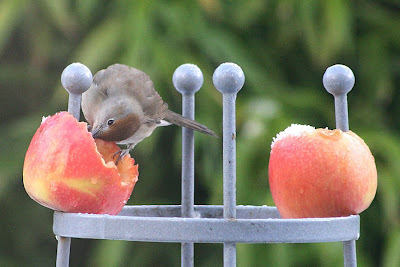 When I've put fruit out it has attracted visitors other than birds. 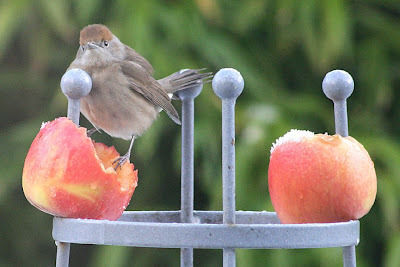 I'm going to try the nut feeder way on top of a pole in the middle of my yard. "Many years ago, late in the year, a cruel wind brought biting cold weather; making the night more bitter for a father and son who had traveled far, and still had farther to go. They had sought a cottage, a barn, or even a tree - anyplace they could seek shelter. But there was nothing to be seen or found, except for a bush, and at last the father built a fire and told his son to try and sleep a little. And when the father's eyes began to droop he woke his son,and bid him watch the fire. Oh how the boy tried to stay awake! But he hadn't really slept while lying on the frozen ground and he was still exhausted from the walk. His eyes got lower. His head got lower. So low in fact that a starving wolf began to inch nearer the sleeping pair. But there was one who was awake. There was one who saw everything from amidst the barren bush; a little bird who was as gray as the brambly wood. The bird hopped down and began fanning the flickering embers until the flames began to lick out hungrily; nor did the little bird stop, despite the pain on his breast, until the flames were dancing with strength. 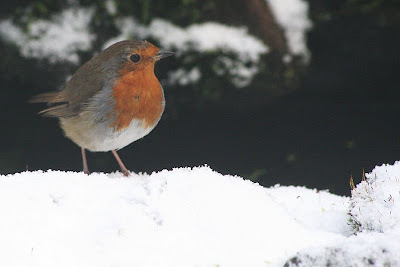 And from that day on the Robin has proudly worn a red breast." Legend has it that when Jesus was dying on the cross, the Robin, then simply brown in colour, flew to his side and sang into his ear in order to comfort him in his pain. The blood from his wounds stained the Robin's breast, and thereafter all Robins got the mark of Christ's blood upon them." So..there you have it. There are other tales out there as well, but I didn't want to take up several pages with a comment!! How nice to find another Scottish gardener! Love your bird photos. We had a fieldfare visit my Dad's garden when we were up in Moray for the holidays - I'll see if we have any photos. Hi Jackie. 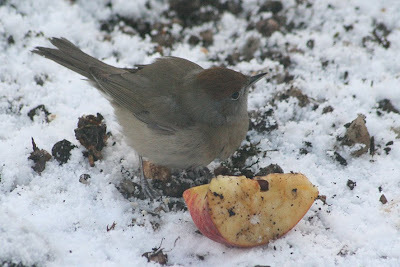 Your pictures of the Blackcap with the apples is wonderful. I must remember to put some apples out. The blackbirds really like them too. Those birds have a wise look in their eyes! I just added a birdbath heater to the garden but have yet to see a bird actually drink from it! I have recently discovered your blog and have really enjoyed looking at your beautiful photos of birds. You must have a lot of patience. Robins definitely seem to be more orange than red to me, but I don't think that robin orange breast rolls off the tongue quite the same.